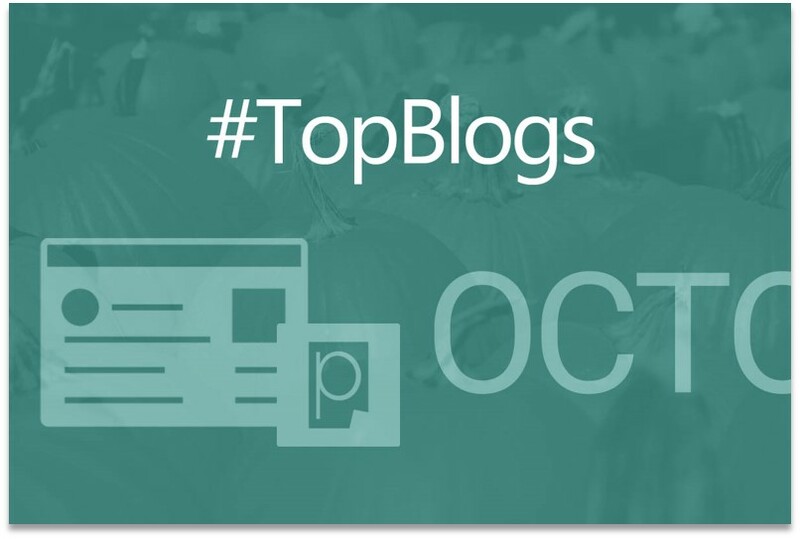 Each month, we feature blogs pushing the boundaries of SEO, social sharing, design, and more. And this month we have a new batch of must-follow marketing blogs to check out. Make sure to visit each blog, and see how they put blogging best practices into action. You increase traffic to your site. You build authority in your industry. 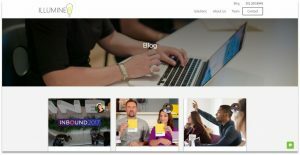 And one blog we came across taking full advantage of promotion is TechWyse. Averaging +100 shares per post, TechWyse makes social promotion look like a breeze. But mastering social like TechWyse isn’t as easy as it looks. 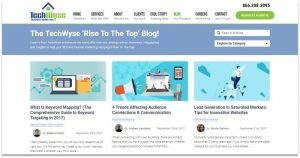 Content writers first have to develop content, write an authoritative piece, and compete against other blogs for visibility. If you’re looking to boost your blog’s social presence, then TechWyse is a good starting point for analysis. Juggling content complexity and reading ease is tough. But it’s what separates good blogs from the great. And one blog we saw striking the balance was ClickTime. Their Analyst-style content is the perfect tone for their audience. 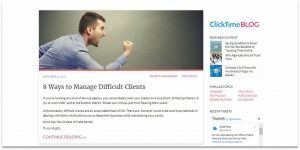 You can tailor your blog writing to reach different audiences, and when we came across ClickTime, we were impressed with their consistent style of writing throughout their blog. Make sure to check them out and give their content writers a follow. If you’re into blogging, you know how important it is to optimize your content for search. Because if you can crack top results for a valuable query, you’ll have floods of traffic hitting your site every day. But again, optimizing blogs for search is easier said than done. One blog we saw optimizing content well across their entire blog was Illumine8. And the second part of that sentence is what’s impressive – their ENTIRE blog. Any author can optimize a single post. But making sure every post has a chance to rank well is what content marketing pros are after. Have a look at the Illumine8 blog and take SEO notes. Author diversity adds flavor to your blog. Because with multiple perspectives, you can cater to different reader needs. And this month we saw the Bartlett blog tapping into the power of author diversity. With over five content contributors, they spread their content across different reader profiles. A home-run tactic for this marketing blog. To increase author diversity, you can ask other members of your team to create content for the blog. You can also look outside your team, and ask experts in your industry to guest blog. That does is for this months edition of our monthly blog roundup – make sure to check back next month to see if you made the list. And don’t forget to analyze your own content performance with Pagezii Blog Analysis Reports. Give our Blog Analyzer a tool a test-drive and understand your blog’s performance in seconds.